If you started your day with Aunt Jemima’s blueberry pancakes, chowed down on a McDonald’s fish patty for lunch, snacked on a Weight Watcher’s Ice Cream Sandwich, polished off a Kraft’s Macaroni & Cheese for dinner and sipped a beddie-bye cup of Nestle’s hot chocolate, chances are you ate a decent helping of wood pulp. Processed from that pulp into a food extender, cellulose (the white powder shown above) is being substituted for costlier ingredients in more and more of America’s processed foods. An industry insider estimates that food producers save as much as 30% using cellulose over more expensive extenders like oats and sugar cane fibers. The Street put out a partial list of manufacturers featuring cellulose in a surprising range of products. While I’ve long noticed cellulose listed on various food ingredient labels, I only recently discovered the stuff was actually made out of gritty wood pulp. Which doesn’t sound like it would be too terrific for one’s digestion. Which in fact it isn’t. Cellulose is indigestible which makes it, according to food manufacturers, a great, cheap sugar substitute for low sugar items so popular with consumers. 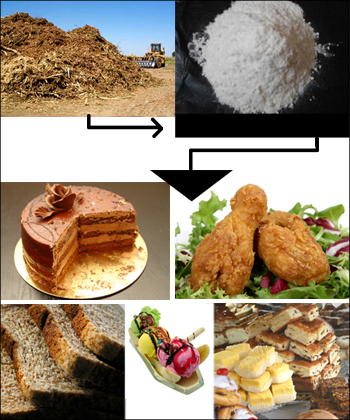 Because it mimics fat so well, cellulose is also increasingly being shoveled onto the low-fat food bandwagon. Beyond being used as an extender, cellulose also makes ice cream taste creamier, imparts a smooth mouthfeel and consistency to salad dressings, provides a firmer texture to baked goods and helps prevent clumping in shredded cheese. Versatile as all get out, cellulose is also spun into vastly different products such as pet litter, automotive brake pads, glue, plastics, detergents, welding electrodes, construction materials, roof coating, asphalt and emulsion paints, among other-um, interesting items. All this may be fine by you. As for me, I can’t help feeling something’s not quite right about eating a piece of bread that contains 18% of processed wood pulp, a concoction also used to crank out asphalt, plastic, detergents and pet litter. How do you feel about the growing use of cellulose in foods? Whoa, Savvy, this has been a real eye-opener. I’m going to pay better attention to ingredients, though oftentimes these days, I have to put on reading glasses to decipher that information. After checking, I seem to have one product containing cellulose gum. It’s a so called “Lite” reduced calorie syrup (for occasional french toast). Next time I buy it I’ll check to see if I can find syrup minus the wood pulp. Hi Pat, you come up with the most interesting stories! I’ve always had trouble digesting processed foods and now I know why :-). I think I’ll stick to veggies. Processed foods kill my stomach also. A while back, after years away, I indulged in some Oreos cookies. Dreadful. A really odd texture that disintegrated with every bite. For me they were so over-processed as to be inedible.